>> After a busy but fun week, it was great to have an unscheduled weekend on the menu. I kicked it off a little early with dinner (consisting of wine and cheese) at August with a friend. C got back from DC late Friday night so we spent some quality time sleeping in and being lazy. 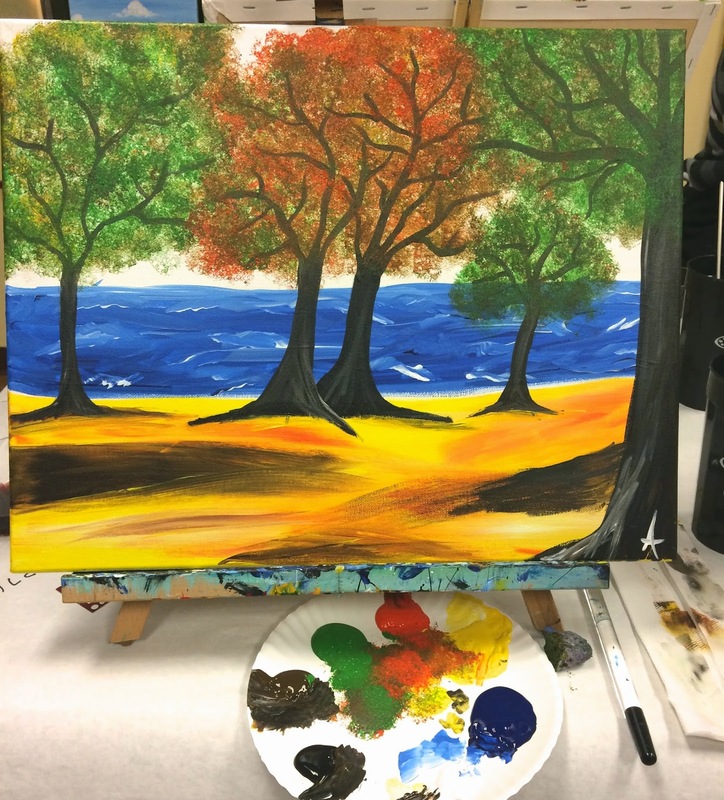 >> We had a little date night at Painting with a Twist followed up by dinner at Post 154 (the old Westport post office!). Painting was so fun albeit a bit tough to just "let go". For two type A personalities, we are all about following directions. I think both paintings turned out great and it was a really fun experience. >> For whatever reason, grilled cheese sounded like the best thing in the world for Sunday night dinner. So we fried up some homemade sweet potato chips and toasted up these delicious grilled cheese sandwiches. Yum! >> T25 has been kicking our butts. The workouts are every day for 5 days (with two on fridays!). They are HARD! We are legit struggling but it feels good to be moving and it's SUCH an easy workout to do at home. I always have time for it and I honestly don't mind doing it. I'm really curious to see what our results are like in 10 weeks. We'll be bringing the CDs with us to Baltimore! >> We're headed to Baltimore to be with C's family for Thanksgiving and it should be a really good trip. It's always such a treat to spend some time with C's family and friends. >> We almost have every inch of our Cali trip planned and booked - so excited! Typically, planning can be really stressful for me and I don't always enjoy it but for whatever reason, it's been so fun to plan this trip. Can. not. wait. Also, Caribbean in March. Yes. >> I'm dying to take this DSLR and Photoshop class. They make such amazing classes and this is an amazing value. I took one of their blogging classes and it was so so good.